The first Community Conversation of 2018, titled “Black Panther, Celebrating Blackness in the African Diaspora,” celebrated and analyzed black culture around the world by focusing on the $1.2-billion-grossing superhero film. Black Panther is based on the Marvel superhero character from the fictional African nation of Wakanda, but incorporates a mosaic of real cultural elements from the continent. Community Conversations is an initiative of the office of Global and Community Engagement (GCE) in the Faculty of Liberal Arts and Professional Studies at York University. In the film, the old king’s son, T’Challa (Chadwick Boseman), ascends to the throne, inherits the superhero mantle of the Black Panther from his father and reigns over his protectionist nation that has hidden its technological advancement from the outside world. But the sins of the father haunt the son when T’Challa’s cousin, Erik Killmonger (Michael B. Jordan), who had been abandoned in America as a child by the old king, comes to Wakanda to challenge T’Challa’s claim to the throne. Moderated by sociology Professor Sylvia Bawa and held in February at the Fort York Library, this conversation invited community members to discuss the impact and significance of the movie to Africans, diasporan African communities and black communities around the world. The event, which was organized by Rowena Linton, drew participants from various sectors of the community. The conversation centred on issues of identity constructions and representations in the media. Participants discussed, among other things, how the movie impacts black communities differently depending on their geospatial and socioeconomic locations and contexts. The conversation also provided an opportunity for community members to discuss how the tension between T’Challa and Erik are a representation of the tensions between black peoples from Africa and the African diaspora. Another key theme from the conversation was Afrofuturism – futuristic or science fiction themes incorporated into black history and culture – and the elements of African culture present in the film, from clothing and customs to the Wakandan accent. The Wakandan language, isiXhosa, is real and is one of South Africa’s 11 official languages. “Several themes stood out for me in my reflection of the film Black Panther. 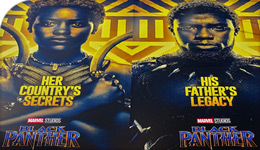 A major category that encompassed several factors was the representation of power and the power of representation,” said social work Professor Mary Goitom, who attended the conversation and commented on this film as the first superhero movie from Hollywood and in North America to feature a predominantly black cast. The conversation also touched upon the consumption and commodification of black lives and black stories, the black body, spirituality in Africa and the diaspora’s connection to the black church, community building and networking, supporting black-owned businesses, the value of money and bartering, and the rise of capitalism. “The capital take-home message from this Community Conversation is the importance of generating more opportunities for these kinds of discussions – and in this particular case, to follow up and explore in more detail the richness of the content of this group’s conversation,” said Goitom. GCE funds Community Conversations, connecting the Faculty and York University with a variety of community groups and members within the Greater Toronto Area. For more information on GCE, contact Rowena Linton at gce@yorku.ca. For more information on Community Conversations, visit the website.